This installment of the Letters from the Flaming Crab-series clocks in at 14 pages, 1 page front cover, 1 page editorial, 1 3/4 pages of SRD, leaving us with 10 1/4 pages of content, so let’s take a look! As always, we begin this installment with a brief letter from the planes- and worlds-jumping vessel called Flaming Crab before we dive into the respective cntent – though this time around, we really get creative. 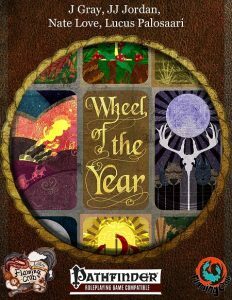 You see, as the pdf’s name implies, this is all about the wheel of the year, a concept probably rather familiar to those of you interested in mythology, pagan religions and the like – but before the respective holidays themselves, we start with full moons. Structure-wise, the respective festival begins with a flavor-based explanation of the celebration, proceeds to mention which deity/deities (domain/theme-wise) is/are aligned with it and then goes on to introduce a mystic resonance as well as a ritual. In the case of full moon, masquerades and organized hunts would be common means of celebrating the festival, with feasts commencing thereafter. Mystic resonance-wise, the full moon, beyond the obvious association with lycanthropes, has actual game-mechanics, with spellcasters being able to cast a single transmutation (polymorph) spell as though quickened ( I assume, with them still requiring the preparation, since this information does not have the “without increasing the spell-slot-caveat, but I may be wrong here. ), while druids may 1/moon wild shape as a swift action. However, conjurations are weakened, with durations reduced and summoned creatures requiring a save to avoid the effects of being temporarily confused. Now I also mentioned rituals – these would be presented as spells for the respective holidays, however, as the pdf suggests, they probably should be freely available to the respective characters. Their casting time, unsurprisingly, is pretty long, with durations lasting e.g. until midnight. For the full moon, the spell would be call of the huntmaster, which can only be cast on a full moon and requires a bonfire. Effect-wise, this ritual makes ammunition magic, enhances one animal per participant with magic fang and provides expeditious retreat to the mounts of the hunters, making the hunting party significantly more potent and providing some serious flavorful potential for roleplaying. During the Yule/Yuetide festival, light and fire spells may be enhanced (here with the wording being precise and sans ambigueties) and, in an interesting twist, there is a random chance that the respective spell slot is not expended, with spontaneous/prepared caster paradigms being accounted for. However, necromancy is hampered during the festival. Yule tree requires an animal sacrifice for the tree to be consecrated, but items may be summoned forth, but only one for each participant in a given year. Cool take on the festival! Imbolc, halfway between Yule and spring equinox, is aligned with divination, poetry and growth and as such evocations lose a bit of potency (nice additional detriment to waging war in early spring/right after winter), with the spell associated, healing well allowing the ritualistic cleansing of the body via participation in a ritual featuring a well or spring, including losing a variety of negative conditions – which makes particular sense in the context of a less fantastic world where not every 2nd village has a high level caster capable of tending to all the needs. Ostara, if the name did not already elicit that connotation on its own, represents the vernal equinox and thus is associated with regenerative magics, once again hampering the forces of necromancy. The ritual is very evocative, featuring upright-standing eggs placed on the ground to ensure fertility…provided the gods deem to bless their followers. Beltane, as, with Samhain, one of the more commonly known traditional festivals, enhances abjuration magics, with them being automatically affected by either Extend or Enlarge Spell, but all other magics are hampered on Beltane. The massive, bonfire-based rite imbues protective qualities, with even the ash of the fire providing some protective qualities. Midsummer is the festival of marriage and divination, with newly-weds embarking upon the seeking the fern flower ritual, which can either provide a monetary boon to those seeking it or an enhanced aid another for a year. Lughnasadh, the harvest holiday, enhances transmutation magics, but hampers enchantment – those that manage to resist its effects may benefit from heroism for 1 round after the effect. Hero’s shape, as a ritual, is interesting, rendering you literally larger than life and adding bonuses to all physical attributes. While the haste-effect the recipient may tap into could be a tad bit more streamlined in its wording, it is a cool ritual that requires some stamina from the caster to pull off. Mabon, the end of the harvest season, cuts all aligned spells in half regarding their duration and range, while spells affecting willing targets are Extended and basically rendered communal for the day – very unique! The harvest feast rite eliminates exhaustion and the like and provides a hearty glow to the participants. Finally, Samhain provides access to spells that allow for the speaking with other planes or the dead to spontaneous casters (at -2 spell levels! ), but summoning during these times of thinned veils are hazardous, resulting potentially in lethal creatures showing up. Planar Horde, a high-level ritual, allows the caster to conjure forth 50 HD worth of outsiders, with an individual outsider’s HD capping at 6, to do the caller’s bidding – if he provides the payment. Editing and formatting are very good on the formal side; on the rules-language side, there are some minor discrepancies that show the different authors that contributed here, though none truly impede the functionality of the pdf. Layout adheres to the 2-column full-color standard of the series, with great Tarot-card-like artworks depicting them themes of the respective holidays. Kudos! The pdf comes fully bookmarked with nested bookmarks. J Gray, JJ Jordan, Nate Love and Lucus Palosaari deliver one great pdf here; evocative, cool and flavorful, these holidays add a significant sense of the magical to the game world, with the mythological resonance and familiarity of the concepts employed adding a nice sense of continuity with our world to the subject matter. The festivals themselves, though, do retain their significant “magic”, their flavor and unique concepts. I really enjoyed this system and believe that many a gaming world would benefit from holy days that are actually relevant – the general holidays herein already are very evocative and unique While, as a whole, the pdf may fall short of perfection, it is a great buy for a low price, a book that provides a LOT of cool ideas for adventures to come, a fun, flavorful addition to the game – in short, I consider this, in spite of my nitpicks, a great buy worthy of 5 stars + seal of approval.